In 2014, the Marine Geospatial Ecology Lab (MGEL) of Duke University began work with the Northeast Regional Ocean Council (NROC), the NOAA National Centers for Coastal Ocean Science (NCCOS), the NOAA Northeast Fisheries Science Center (NEFSC) and Loyola University Chicago, as part of the Marine-life Data and Analysis Team (MDAT), to characterize and map marine life in the Northeast region in support of regional ocean planning. In 2015, the Mid-Atlantic Regional Council on the Ocean (MARCO) contracted with MDAT to build upon and expand this effort into the Mid-Atlantic planning area. These research groups collaborated to produce “base layer” predictive model products with associated uncertainty products for cetacean species or species guilds and avian species, and three geospatial products for fish species. Cetacean and avian products are habitat-based density estimates, incorporating several physical or biological habitat parameters, and were created for the whole US east coast. Fish species products, based on recommendations from working groups and other experts, were kept closer to the original bottom trawl data, which exist from Cape Hatteras, NC to the Gulf of Maine. Because base layers total in the thousands, efforts to develop a general understanding of the overall richness or diversity in a particular area are not well served by the individual base products. To address this gap and other potential management applications, MDAT has created several types of summary map products from these base layers. Summary products are comprised of data layers from multiple species, and were created to allow quick access to map summaries about potential biological, management, or sensitivity groups of interest. Summary products provide a means to distill hundreds of data layer and time period combinations into more simplified maps that supplement the base layer reference library. These summary products include total abundance or biomass, species richness, diversity, and core area abundance or biomass richness for all modeled/sampled groups of species and are useful tools for seeing broad patterns in the underlying data or model results. Careful consideration must be given when viewing and interpreting base layer and summary products. Section 2 of the MDAT Technical Report describes the methods and review processes for the base layer products, with caveats and considerations detailed for each taxa and product. Section 3 of the MDAT Technical Report describes the methods and review processes for the summary products, with caveats and considerations detailed for each taxa and each type of product. In addition to being hosted on the Northeast and Mid-Atlantic Data Ocean Portals, the MarineCadastre.gov team has selected a subset of the summary products to include in the National Viewer. Learn how to combine these services with other MarineCadastre.gov data in their Tutorial: Using the MarineCadastre.gov Services in ArcMap (Version 10). Periodic updates to the base layer models and data are produced by the individual institutions in the MDAT team based on schedules set by the funders of each modeling effort. MDAT summary products are updated as new models and data become availabe, as feasible. For each group of species, total abundance maps are calculated in a Geographic Information System (GIS) by stacking the predicted annual abundance layers of each species that is a member of that group, and summing the values of the cell in each resulting “column”. The result is the total predicted abundance of all individuals (of the included species) in that cell. For cetaceans, this is total predicted abundance but for avian species groups this is total predicted relative abundance, and for fish species groups this is total biomass. For all species in a taxa together (i.e. all cetaceans) and for each group of species, species richness maps are calculated in a Geographic Information System (GIS) by stacking each individual species’ predicted presence or absence and counting the total number of species present in each cell. 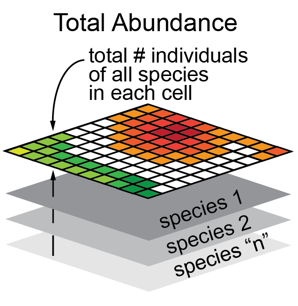 A species is considered present in a cell if the cell is included in the area containing 95% of the total predicted abundance or biomass for that species. Some mammal species were modeled as a guild to create the best available model at the guild level (e.g., beaked whales, pilot whales) when not enough data were available to create robust models at the individual species level. To better reflect true species counts in the richness map products, these guild density maps were counted as multiple species. For example, each beaked whale cell counts as four species (Blainville’s beaked whale, Sowerby’s beaked whale, and True’s beaked whale). 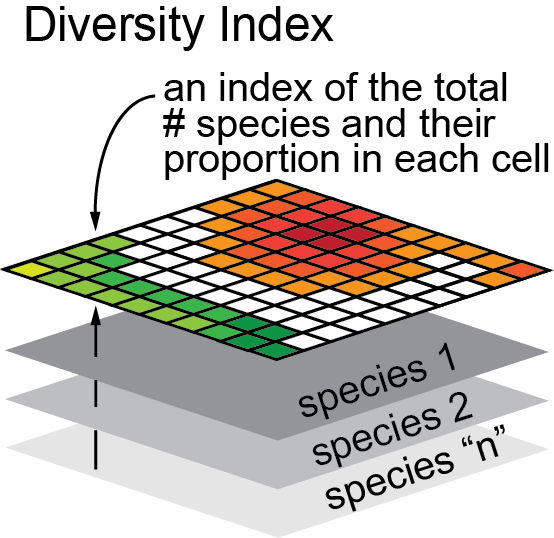 To create maps showing areas of high and low biodiversity, two indices of diversity were considered: the Shannon diversity index (Shannon & Weaver, 1949) and the Gini-Simpson diversity index (Gini 1912, Simpson 1949, Greenberg 1956, Berger & Parker 1970). Each index has strengths and weaknesses, depending on the question that the user is hoping to answer. The Shannon index is most sensitive to changes in rare species, whereas the Gini-Simpson index is most sensitive to changes in abundant (e.g., dominant) species (Peet, 1974). Map products for both indices were created for each species group1. Different diversity indices have strengths and weaknesses, depending on the question that the user is hoping to answer. 1Because avian individual species model outputs are representations of relative abundance (not absolute), it would be inappropriate to calculate diversity metrics which rely on measures of absolute abundance. The purpose of a core abundance area map is to represent the smallest area containing 50% of the predicted abundance of each species. 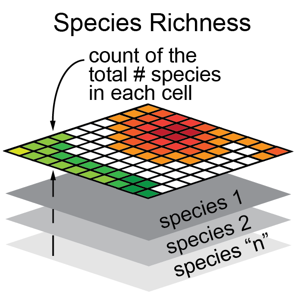 Summing all the cells (pixels) in the species distribution product gives the total predicted abundance. Core area is calculated by ranking cells by their abundance value from greatest to least, then summing cells with the highest abundance values until the total is equal to or greater than 50% of the total predicted abundance for the entire study area. Core abundance area richness is then calculated using the same methodology described above for “Species richness”, using the core abundance maps as input. The Marine-life Data and Analysis Team developed and delivered the marine life base layer products and summary products as part of a collaboration with the Northeast Regional Ocean Council (NROC) and the Mid-Atlantic Regional Council on the Ocean (MARCO). Development of the summary products was guided by the Northeast Regional Planning Body (NE RPB), NE RPB expert work groups, the Mid-Atlantic Regional Planning Body, and the Mid-Atlantic Data Synthesis Work Group. Through NROC, this work was funded (in part) by cooperative agreement numbers NA12NOS4730010 and NA12NOS4730186 from the National Oceanic and Atmospheric Administration (NOAA). The views expressed herein are those of the author(s) and do not necessarily reflect the views of NOAA or any of its sub-agencies.